Oakland coach Greg Kampe must have developed a fondness for Eisenhower players after the success he found with forward Corey Petros. 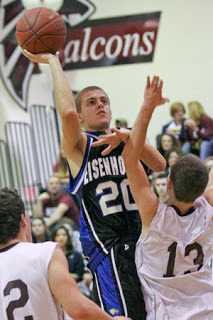 Eagles' guard Alek Frascone gave his verbal commitment to Oakland University Sunday evening. Living in the shadows of the Rochester-area school and attending summer camps at the O'rena left a lasting impression on the 6-foot-2, 185-pound combo guard. "I've been wanting to go there since I was a little kid," Frascone said. Frascone said he has yet to take an official visit, adding he also received offers from Division II schools Northwood, Hillsdale and Lake Superior State University. Oakland offered him in late June, Frascone said. Frascone said the offer came as a preferred walk-on with the possibility of becoming a scholarship player. Of his future coach, Frascone said of Kampe, "He's not a soft coach. He'll get on you if you make mistakes." 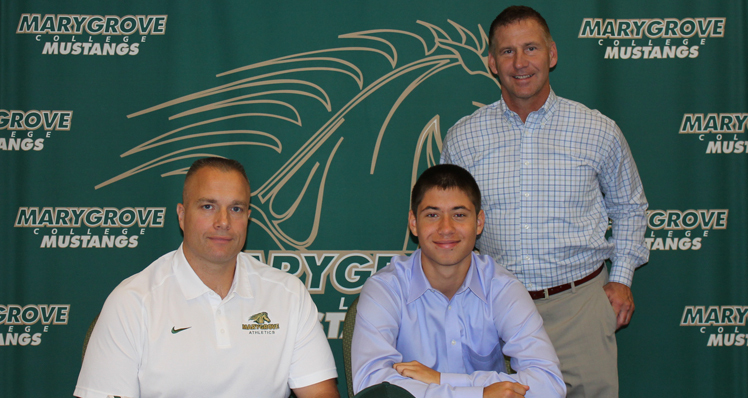 Tyler Sykes of Stevenson has signed a letter of intent to continue his basketball career at Marygrove College in Detroit, Mustangs coach Dave Sichterman said. Sykes, a 6-foot-1 combo guard, became the fifth 2013 recruit to join Marygrove, a member of the Wolverine-Hoosier Athletic Conference. Sykes averaged 18 points per game and was named to the All-Macomb County team as a senior. He led Stevenson in scoring as a junior and senior. "We are very pleased to announce the addition of Tyler to our men's basketball program," Sichterman said. 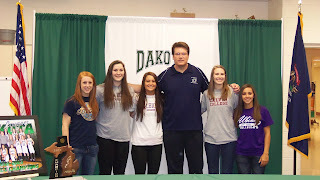 "With the signing, we grabbed arguably one of the top five players from Macomb County this year. Tyler had several options due to his strong play and ended up choosing Marygrove to continue his academic and athletic career." 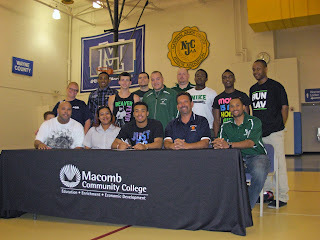 Zach Ferguson of Fraser will continue his basketball career at Macomb Community College, Monarchs coach Jim Twigg said. Ferguson is a 6-foot, 175-pound guard. 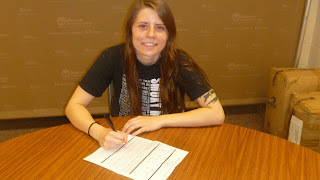 Ferguson plans to study business at MCC. Zach Sand of Armada will continue his track & field career at Detroit Mercy, Titans coach Guy Murray said. Sand specialized in the long jump at Armada. Murray said Sand likely will compete in the triple jump at UDM. L'Anse Creuse North grad Destiny Rasche will attend Macomb Community College where she will be a member of coach Jay Ritchie's women's basketball team. In high school, Rasche was twice named All-County. Rasche played at both New Haven and L'Anse Creuse North. In addition to her athletic awards, she was all-academic all four years in high school. She completed high school with a 3.91 grade point average. Here's one Rocket who hopes Macomb Community College is a launching pad for bigger and better things. Rayshawn Griffin, a 6-0, 190-pound guard, has signed to play at MCC for Jim Twigg, the men's basketball coach. Playing for high school coach Tedaro France, Griffin captained the New Haven team during his junior and senior seasons. Griffin scored over 1,000 points during his prep career. He was named to the All-State, All-County and All-Conference teams. He was also named the Rockets' MVP. In addition to basketball, Griffin also played football and soccer. He is the son of Mary Thomas and George Griffin and is undecided on his major. 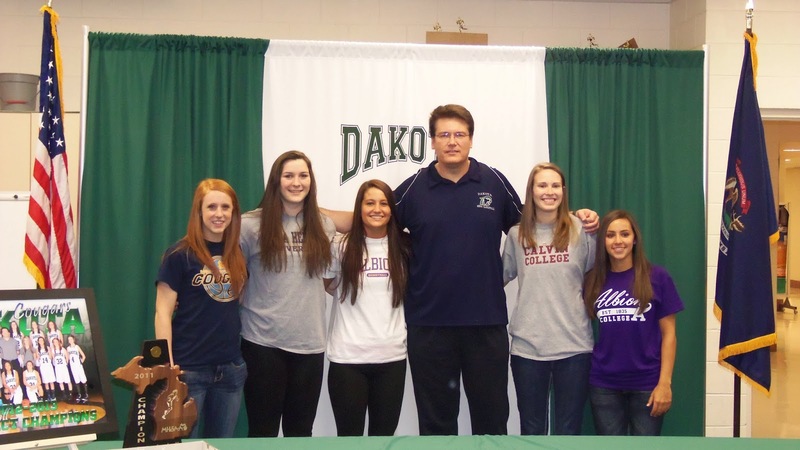 Dakota girls’ hoops coach Phil McCune is sending an entire basketball team onto play college basketball. The five graduating seniors are Miranda Bates (Albion), Kylie Churches (Siena Heights), Kylie Townsley (Spring Arbor), Kyli Verduci (Calvin) and Olivia Savage (Albion). The Macomb Daily sports staff includes editor George Pohly and staff writers Jim Evans, Chuck Pleiness and Amanda Lee.